On June 11 and 12, 2016, Canadian Forces Base Borden celebrated their Centennial with their Armed Forces Day and Air Show "100 years of freedom". Ron Cembrowski reports, all photos by author. With the onset of World War I (WWI) the Canadian Government recognized that there would be an urgent need to train infantry. Therefore, in 1914 18,000 acres of land know as "The Sandy Plains", west of Barrie, Ontario, was purchased for the establishment of a new base. In April 1916 the Grey and Simcoe Foresters, Canadian Army companies from Barrie and Collingwood, Ontario, arrived and began to clear the land. On July 11, 1916, "Camp Borden" was formally opened. It is named in honour of Sir Fredrick Borden who the Minister of Militia, under Prime Minister Sir Wilfred Laurier, from 1896 to 1911. Mostly a tent city in the beginning, Camp Borden had accommodations for 30,000 people. In 1916 the United Kingdom requested space for the Royal Flying Corps (RFC) to train aircrew. On May 2, 1917, the first military airfield opened in Canada as RFC Station Camp Borden encompassing 850 acres at the base. In October of 1917 the RFC in Canada was reorganized into a Training Brigade with RFC Station Camp Borden designated as No.42 Wing (Camp Borden), RFC Station Deseronto designated as No.43 Wing (Deseronto), and RFC Station North Toronto designated as No.44 Wing (North Toronto). On April 1, 1924, the reorganization of the post-WWI Canadian Air Force was completed and the prefix "Royal" was officially adopted. This date therefore marks the birth of the Royal Canadian Air Force (RCAF), with Camp Borden being recognized as the official birthplace. During World War II (WWII) No. 1 Service Flying Training School (SFTS) was established at RCAF Station Camp Borden under the British Commonwealth Air Training Plan (BCATP). On September 30, 1940, the first 39 pilots graduated from No.1 SFTS at Camp Borden. Borden also became an important training centre for Canada's emerging Armored Corps. No.1 SFTS ceased flying training in 1946 and Camp Borden continued to serve as a post war Army Training Centre. On February 1, 1968, under the unification of the Canadian Armed Forces, Camp Borden and RCAF Station Borden became Canadian Forces Base (CFB) Borden. The 2016 theme for the CF-18 Demonstration Hornet was selected to commemorate the WWII British Commonwealth Air Training Plan (BCATP) in Canada. The BCATP agreement was signed by the United Kingdom, Canada, Australia, and New Zealand in late 1939 with the first schools opening in 1940. In its 5 year life (1940 - 1945) the BCATP produced 131,553 aircrew, including pilots, navigators, wireless operators, and air gunners. The lasting legacy BCATP provided to the modern Royal Canadian Air Force came from Article XV of the agreement that stipulated that BCATP graduates from Australia, Canada, and New Zealand were to be assigned to squadrons in their respective national air force or be identified with their specific national designation if assigned to a different air force. This eventually resulted in the formation of the "400 block" squadrons. The first of these RCAF squadrons were formed on March 1, 1941 with the other RCAF "400 block" squadrons formed throughout the war into early 1944. It is for this reason that Canada is celebrating the 75th anniversary of the BCATP and the formation of the first of the "400 block" RCAF squadrons (1941 - 2016). 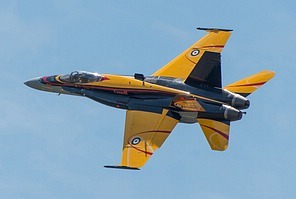 The 2016 CF-18 Demonstration Hornet paint scheme is styled after the high visibility "Yellow Wings" trainers used in the BCATP, during WWII. The contrasting black and yellow paint scheme was designed by graphic artist, Jim Belliveau, and was applied by a team of RCAF technicians. According to Mr. Belliveau the black colour is intended to represent the darkness of war while the bright yellow tail vignettes are symbolic of the flame against the darkness. The aircraft also carries the names of 134 communities in Canada that had BCATP establishments. For more information about the BCATP in Canada, see our report on "The Plan" and BCATP aircraft fly-in at Hamilton. On June 11 and 12, 2016 CFB Borden celebrated their Centennial year, "100 years of freedom" (1916 - 2016), with their Armed Forces Day and Air Show. CFB Borden no longer has any active runways. A grass field now resides where the paved runway used to be. Only a portion of the runway still exists along the northeast corner of the field. This requires the jet aircraft performers to stage out of Lake Simcoe Regional Airport (CYLS), which is located approximately 50 km east of Borden. The aerobatic acts and warbirds, that were capable of using grass fields, staged directly out of Borden. This photo-report covers the air show activities on the Media Day, held on Friday, June 10, at Lake Simcoe Regional Airport, as well as over the two air show days at CFB Borden. Media Day was split between CFB Borden, featuring the civilian/aerobatic acts, and Lake Simcoe Regional Airport with the jet aircraft. Friday included media rides as well as the performer practice runs. The first operational jet fighter used by the RCAF was the deHavilland DH100 Vampire. The RCAF's first Vampire was a MkI, taken on strength on November 22, 1946, and was operated with the Winter Experimental Establishment in Edmonton, AB, for evaluation purposes. Two aircraft types were eventually selected for the fighter role. One was the deHavilland Vampire, and the other the North American P-51 Mustang. The first Vampire Mk III was taken on strength on January 19, 1948. In total 85 Vampire Mk IIIs were flown by the RCAF beginning with the Central Flying School at RCAF Station Trenton, ON. The first operational Vampire squadron was 410 (F) Sqn based at St. Hubert, QC, on December 1, 1948. On May 4, 1949, the 410 (F) Sqn Aerobatic Team "The Blue Devils" were formed. They performed in 45 air shows in Canada and the U.S. before being disbanded in August 1951. The Waterloo Warbirds Vampire is a two seat T.55 (DH115) trainer and although Canada never flew the two seat model this beautiful restoration is a most welcome addition to the local Warbird scene. Manufactured in Switzerland in October 1958, it is now displayed in Canadian markings and is the only flying Vampire in Canada. The opening ceremony began with the Base Commander Brigadier-General Carl Doyon and the Base Chief Warrant Officer Gilles Godbout arriving, by a 400 Squadron CH-146 Griffon helicopter, at field centre stage. This was followed by the Base Commander's welcome address. Sadly the SkyHawks were forced to cancel their drop. They were airborne in a 450 Squadron CH-147F Chinook when the final drop assessment indicated that the winds were too high. This happened on both days of the air show. Clearly disappointed, the team members landed at the field centre stage and gave a salute to the crowd that was very warmly received. In spite of the less than favourable weather, the base still put on a great show, with the majority of the performers being able to make an appearance. Bell 412CF 'Outlaw' - used by the Canadian Forces for Advanced Helicopter Training at the Canada Wings Aviation Training Centre (CWATC) in Southport, MB. These aircraft are operated by Allied Wings consortium, which is the Primary Contractor at Southport. It is interesting to note the large number of CT-114 Tutor training (ground instruction) airframes at the base. Most if not all of these aircraft were stationed at one time or another at 15 Wing CFB Moose Jaw, SK back when the Tutor was used as the primary jet trainer. The Tutor was replaced by the CT-156 Harvard II and the CT-155 Hawk in 2000. Category A	Aircraft is capable of engine run-up. Aircraft not considered airworthy without additional inspection and maintenance. Category B	Aircraft is used for disassembly and reassembly training. Category C	Aircraft major components, cockpit sections, tail sections, engines, etc. Category D	Aircraft used as a target, for Aircraft Battle Damage Repair (ABDR), etc. In short, it was a terrific weekend with plenty of sun and great photo opportunities, in spite of the unwanted high winds. The flying displays were superb and the ground displays plentiful and interesting. A big "thank you" is owed to the Borden Base Public Affairs Officer (PAO) and the CF-18 Demonstration Team and Snowbirds PAOs for affording me the access to the performing aircraft on media day. 16 Wing is a lodger formation at Borden and has approximately 300 personnel. The Wing is comprised of a Headquarters and six training establishments, two of the establishments are based at Borden.